“The year is 2047, a century of technological revolution. The revolution did happen, just not the way people thought it would.” Most of the world’s population spend their entire lives online, connected only in virtual reality. Real life no longer matters to most until people begin dying when they’re online avatars are killed. When virtual reality gets too real as VR blends with RL in death, a corporate agent in Paris is sent in to investigate the murders. Agent Nash (Mike Dopud) weaves through an online gaming reality to solve the mystery of who’s found a way to make gaming deaths actuality. Writer and director Guy-Roger Duvert blends movie with video game in his first feature film. On a three million dollar budget Duvert with BluFire Studios and Backlight Studios create a beautiful CGI world that not only looks better than most blockbuster movies but also provides a reason within the script for their virtual reality it creates. While the effects may not compete with the best out there, they’re far better than most theatrical releases and for the budget blow other films out of the CGI water. The gamers of the world are growing while film is a slowly dying art form. I don’t believe young gamers have interest in watching a movie similar to their games without being able to direct where the action goes via the controller in their hands. On that same note, as a film fanatic who doesn’t game a video game on film isn’t something I need to see in feature form. 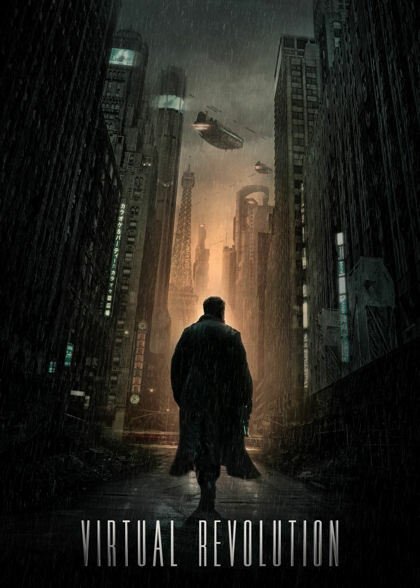 Stunning to watch, the plot is comparable to the 2009’s largely forgotten movie Surrogates done in Blade Runner fashion, leaving Virtual Revolution not exactly revolutionary. Action movies aren’t exactly my preferred genre so I could see 2047 appealing to the action film fans out there or a bigger Sci-Fi fanbase.